This image appears in this blog article titled "Wind tunnel testing a Grumman Albatross model"
Although I'm not very familiar with Albatross development, the model looks like something else entirely to me. 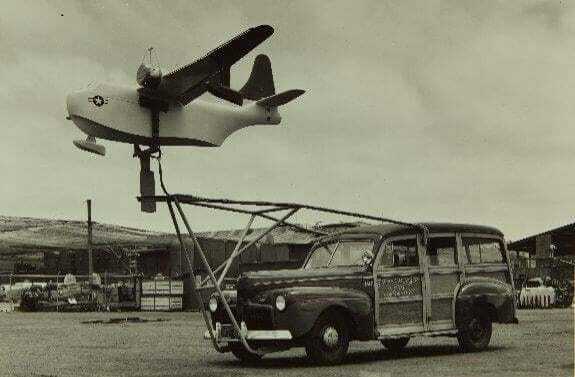 Consolidated Consolidated XP4Y Corregidor perhaps? Except that Corregidor is supposed to have twin tail. Can anyone confirm the claim or ID the model? That tailfin looks like a Martin P5M Marlin but that fuselage does look like a Consolidated P4Y-1 Corregidor. Well, someone commented on the original blog post saying that it's Boeing Sea Ranger. I'll have to go back through the old SeaRanger article and see if there are any pics of a wind tunnel model. Certainly NOT the Sea Ranger, I suspect it may have been a test of a single fin Corregidor.